Animations are a powerful tool to illustrate how an accident occurred, and to make an engineer's accident reconstruction more accessible to individuals without engineering expertise. In a recent case, we were able to make a 3d animation that showed the plaintiff's description of how an accident occurred was not consistent with the forensic evidence at the scene. We were also able to compare our animation to a security video from a nearby gas station that captured the accident, showing that our reconstruction and animation matched the security video footage (see comparison to the left). The available surveillance video of the accident showed partially obscured views of the vehicles up to, including and beyond the moment of impact in the background region of two separate security cameras. 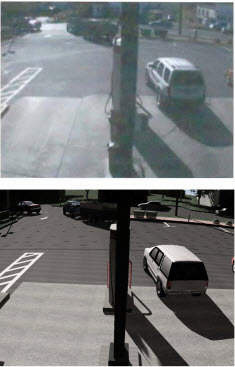 In both camera views, the Chevy pickup and trailer were clearly visible, allowing us to determine that after the driver pulled away from the gas pump, he waited approximately 15 seconds from the time he came to a stop in the parking lot exit to the time he pulled out into the road. The Ford pickup first entered the security camera field of view approximately 1 second after the Chevy started its left turn, directly contradicting the Chevy driver's testimony. Furthermore, during the time it was visible in the surveillance footage, the Ford pickup truck was never located in the same position in two consecutive frames, indicating that it was constantly in motion during this time, regardless of whether or not it came to a stop while it was off camera. The surveillance video also allowed us to perform a vehicle motion analysis based upon our inspection of the accident site and the subject vehicles, thus determining the position of each vehicle at various moments in time relative to features of the scene and other landmarks measured at our inspections. In addition, we were able to calculate certain vehicle speeds for those vehicles that were visible in multiple video frames. This was relevant because the Chevy driver testified that the impact occurred in the eastbound lane (i.e. 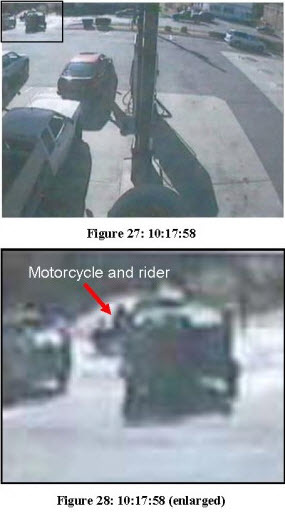 that the motorcycle had left his proper lane of travel), but by analyzing the surveillance footage, we were able to demonstrate that the impact actually occurred in the motorcycle's westbound lane. This motion analysis was then combined with all the other available information to create computer-generated three-dimensional animations of the accident.